These aren’t the easiest of days for supporters of the U.S.-Israel alliance. Bibi is taking every chance he gets to tell the world that America’s about to cut a “bad deal” with Iran. Kerry is warning Israelis on prime-time TV of a third intifada should peace talks fail. Shimon Peres, unsurprisingly, just wants everyone to get along. So U.S. Ambassador to Israel Dan Shapiro, who has emerged as the head cheerleader for the two countries’ friendship, was probably relieved last night to be the bearer of some good news. 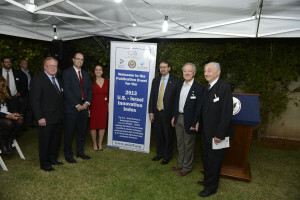 Speaking at a tony reception at the home of the U.S. embassy’s economic attaché in the Tel Aviv suburb of Herzliya, Shapiro hailed the release of the first “U.S.-Israel Innovation Index,” a report that quantifies the strength of collaboration between the two countries on technological and business innovation. The report does paint a rosy picture of U.S.-Israel collaboration. Measuring the strength of the two countries’ cooperation in four areas — government, private sector and industry, human capital, and research and development — the report found that the U.S.-Israel economic partnership ranks third in overall strength behind the U.S.-Switzerland and U.S.-Canada economic partnerships. Switzerland topped the list because it leads the world in the pharmaceutical industry; Canada’s border with the U.S. is the main driver behind the countries’ strong relationship. Not surprisingly, the report found that Israel’s cooperation with the U.S. is strongest when it comes to government-to-government partnerships. Israel also performed well in the other three categories, and Liebschutz hopes the findings will persuade even more companies to do business with Israel. Of nearly 300 international R&D centers in Israel, nearly 200 belong to U.S. companies.